There are a few key steps to creating a dynamic and intriguing website that will appeal to your target audience. First, you have to decide what information they’ll be looking for and what information you want them to know. Second, you need to create an appealing and modern way to relay that information to them. Finally, you need to market your new website so that your audience knows it exists. This blog is the first in a series that will help you conceive and design an effective website for your business. Step one: Decide what information to share with your audience. Prospective consumers like to know what to expect. Pictures are a great way to convey your services and experience quickly. Impressive pictures make a better first impression than pages of text and are more interesting to look at. You’d much rather look through a photo album than read a journal, wouldn’t you? Pictures will give your prospects a taste of what to expect and will intrigue them enough to make an appointment with you. However, all of this is moot if your pictures aren’t of good quality. Uploading grainy pictures taken from your iPhone will lead to disinterest and a low perception rather than boosting interest. Speak to the photographers of any weddings or styled shoots that you’ve been a part of and ask permission to use those photos in promotional materials and on your website. Having high resolution, professional shot photos will make for a more credible, reliable, and professional looking website. Whether you’re a florist, videographer, photographer, bakery, etc. you MUST include photos of your previous work in order to show your experience, diversity, and skills. If you’re a DJ or musician, maybe that means putting together a playlist your clients can scan through or musical selections you’ve played at weddings. If you’re a hair or makeup stylist, show before and after pictures of brides and their bridal parties. They say a picture is worth a thousand words. By including photos of your work, you are making any customer testimonials that much more credible and increasing a client’s perception of you ten-fold. Clients will spend an average of 5 minutes or less on your web page. If the information they are looking for is not clearly labeled or is difficult to find, you can be sure that they’re not sticking around to look for it. They want their questions to be easily answered and any information they seek to be easy to find. Having a menu at the top of your homepage is a great way to show prospects the different pages you offer. If you have more than six pages, consider creating a category and adding dropdowns of similar topics. For instance, a photographer can label one category ‘Portfolio’ and have a dropdown of Engagement Shoots, Graduation Photos, Weddings, Maternity, etc. Make your labels and headlines clear and consistent. Clients shouldn’t have to try to guess what kind of information will be on the page they’re going to. If they’re looking for to get ahold of you, they don’t want to have to decide between ‘Contact Us,’ and ‘Inquiries.’ Make it easy for them to find what they’re looking for. Another way to do this is by creating headlines. Though we don’t recommend having a lot of text on your website, if you do find that you need a few paragraphs to define or clarify things, use headlines to separate topics. That makes it easy for visitors to scan through the page to find the answer to exactly what they’re looking for. Writing isn’t everyone’s strong suit – we get that. But writing about yourself and your company should be easy! After all, it’s what you’re passionate about, isn’t it? Your About Us page should be personal and inviting. Write as if you’re having a conversation with a prospective client. Keep it light and friendly. It’s not a list of statistics of how many years you’ve been in business, how many weddings you’ve done, or where you went to school. A bride wants to know more about you. 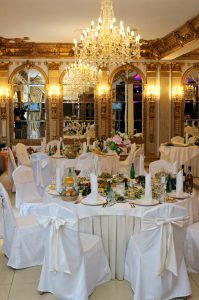 While experience is important, the wedding customer is unlike any other. They want to find a vendor who can connect with them on a personal level and understand their vision. Therefore, they want to get to know you. Do you have pets? Kids? How’d you meet your husband or wife? What’s your favorite ice cream flavor? What TV show is your latest obsession? Include fun details about yourself as well as a picture to connect with future clients and create a sort of loyalty before they even meet you! Something as small as both loving Daenerys from Game of Thrones creates a bond between you which could lead them to hire you over your competition. Font is an extremely important aspect of creating your website. You may just go with the standard Ariel or Times New Roman – which is fine – but even deciding between those two fonts sends creates a different message to the reader. There are a few categories that all fonts fall within: serif, san-serif, and script. Choosing the right category is important, but once chosen, you then have to find a font style within the category. Times New Roman is a Serif font, meaning it has little notches where the lines end on each letter, giving it an almost engraved look. This font is used for more formal context. It’s typically used for research and reports as they are several pages long and serif fonts are easy to read. It’s becoming less common to use – especially in more casual and informal settings. However, if you do have a page that features a lot of text (which we don’t recommend), use a serif font. Reading on a computer can be hard already, but using a serif font will make it easier to distinguish each letter. San-Serif font is a more rounded look that replicates handwriting. Many millennials find it to be more visually appealing than serif fonts. Because of this, we’ve seen a growth in popularity of san-serif fonts – especially digitally. 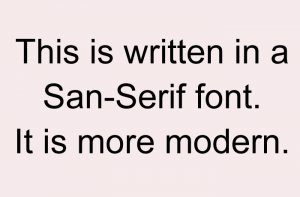 Facebook, Twitter, Google, and others all use san-serif fonts as their default. Because you shouldn’t have much text on your site, san-serif font is a good option to make your site seem appealing and modern. Script fonts are great for headlines and larger context – such as 36 or 48px – but can get very difficult to read at smaller sizes. With all of the swoops and swirls, letters easily become hard to decipher and can run into each other quite easily. If you have a headline that features multiple words – like “Limousines are a classy way to get you from point A to point B!” – consider using a san-serif font, instead. For shorter headlines – like “Specialty Limos” – a scripted font will draw the eye to the headline and create interest, texture, and diversity. 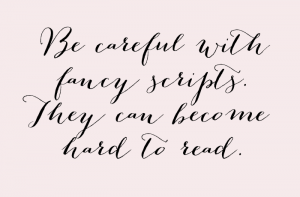 Scripted fonts stand out – especially when used among serif or san-serif fonts – but you shouldn’t craft your entire website with scripts. It should only be used with larger text and in logos. After choosing your font, you should be aware of the size of the text and line-height. The size of your text may look fine on your desktop, but may not translate well to a mobile device. Your font should be at least 16px, and the line-height should never be a number smaller than the size of the font. For example, if your font is 18px, your line-height should be 18pt or higher. 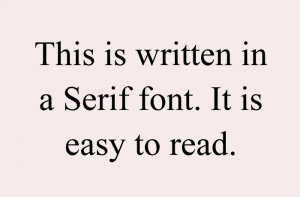 Finally, your font should be consistent on each page. Don’t use Ariel on your homepage and Calibri on your Contact page. Consistency is key when it comes to creating a credible website. It’s no secret that price is a huge factor when it comes to hiring any service. One of the first questions you’ll hear is “How much does this cost?” and you’re probably guilty of it, too! Brides are always looking for “affordable” options, and they don’t want to waste their time pursuing a service they can’t afford. We’re not saying you should completely outline how much each service or product costs on your website, as that might decrease the number of inquiries you get. However, mentioning an idea of your cost will not only produce more inquiries but will produce quality inquiries. Simply state “Our tents start at $600,” or “Buy a tux for as low as $200!” to intrigue and satisfy your client’s curiosity of your price range. want more website tips? We’re here to help! At the bottom of your website there should be a copyright date. This date needs to be current. If your website says Copyright 2007, brides will instantly be put off. They’ll assume one (or all) of three things: 1) you’ve gone out of business, 2) you’re not dedicated to your business. Maybe it’s a side job and not your full-time passion, so you won’t be as reliable or deliver as quality work as your competition, 3) if you’re not up-to-date with modern technologies – like how to update your website – then you probably don’t know much about modern wedding trends, either. We’re not saying any of this is true. You’re great at your job! But brides will get the wrong impression if your website looks like it was first created when Al Gore invented the internet…especially if your copyright date reflects that. Testimonials are one of the best ways to gain credibility and increase sales. Word-of-mouth is still one of the best ways to garner more attention, and having testimonials and reviews is like having digital word-of-mouth. Post some of the best reviews on your website so prospective clients can see the quality of work you produce, your experience, your customer service, and how other’s have perceived your work. Asking past clients to leave a review is a free and rewarding way to market your business. Brides will look for your reviews no matter what, so offer them a page on your own website that will show them what they want to know. Find out more about why customer reviews are so important. A blog is a great way to constantly update your website and draw in more visitors. However, blogs aren’t right for every business. This blog can help you decide whether you should start your own. 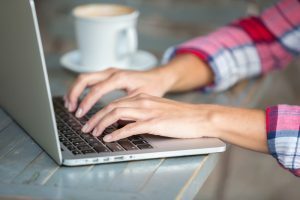 If you decide to start a blog, it’s important to be consistent and up-to-date. You can’t post once and then not post again for another three months. That will only hurt your reputation and credibility rather than helping it. But, if done right, a blog can boost your sales. Because you are posting about the latest wedding trends, brides will find you knowledgeable, trustworthy, and credible. If you write in a conversational and slightly humorous tone, they’ll connect with you on a personal basis and will want to meet you in person to share their vision and ideas. If you post consistently, they’ll know that you are dedicated to your business and passionate about what you do. Millennials were raised with technology. They grew up in an age where answers were at their fingertips in an instant. They are big on instant gratification and they don’t like to dig around to find answers. That being said, when they visit your website for information, they want it to be easy to find. That means no paragraphs of text to dig through, no creative headlines that don’t hint to what the content is about, and no playing hard to get. Offer lots of pictures, include contact information as well as a contact form, and make sure your page is simple to navigate.